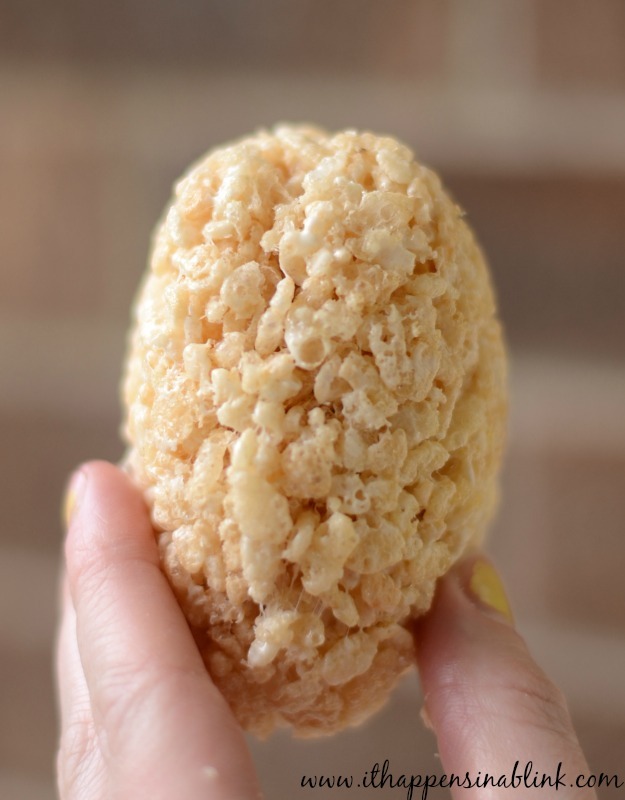 I have been compensated with materials and reimbursement for these yummy Rice Krispies Easter Egg Treats. Photos, thoughts, and craziness are all my own. Sometimes I think Pinterest will be the death of me. Make this! Create that! What- I didn’t bake a five layer masterpiece for Easter brunch? Wait… I was supposed to have Easter brunch? I have to keep myself grounded and remind myself that I have four kids. This translates to approximately fifteen minutes of spare time a day, five of which I have to allot to a bathroom break. In order for my daughter and I to find quality time in the kitchen, we have to Keep It Simple! 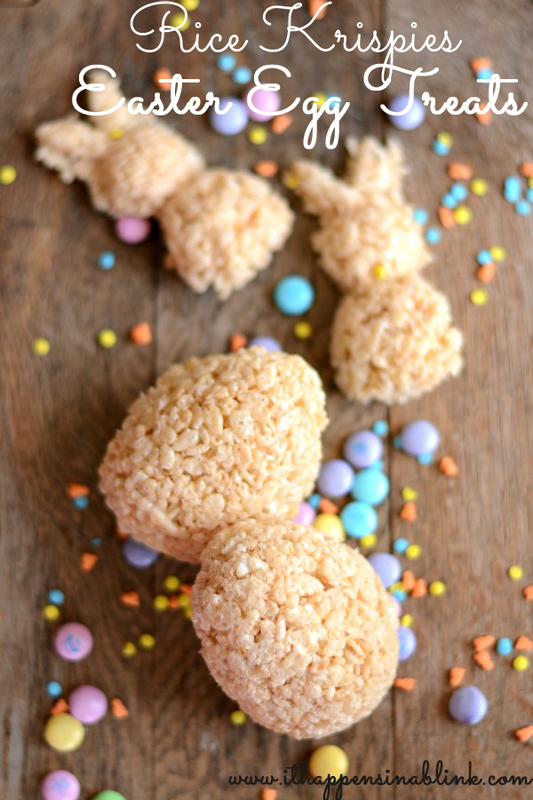 That’s why this Easter we are sticking with a tried and true favorite– Rice Krispies Easter Egg Treats. Psst….these have a special candy surprise! Begin by doing the oven work before the kids help. My kids are enamored with the oven, and I don’t want anyone to get burned, so I do the hot part myself. Make a traditional Rice Krispies treat mix by melting 3 tablespoons of butter in a skillet and mixing it with 4 cups miniature marshmallows. Stir until melted. Remove from heat and add 6 cups Rice Krispies. Stir until that deliciously sticky mix is combined to perfection. Now the fun part! Bring the kids in and start shaping those Easter Egg Treats. Add an indention in an egg for small candies. Create another egg and place it over the first one to close the egg and conceal the sweet surprise. 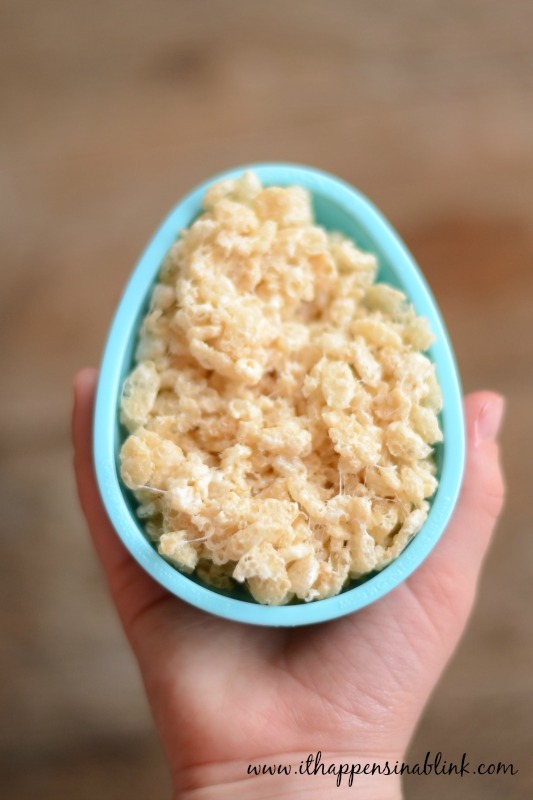 Let the kids have fun decorating the Rice Krispies Easter Egg Treats. My daughter is sprinkle crazy. 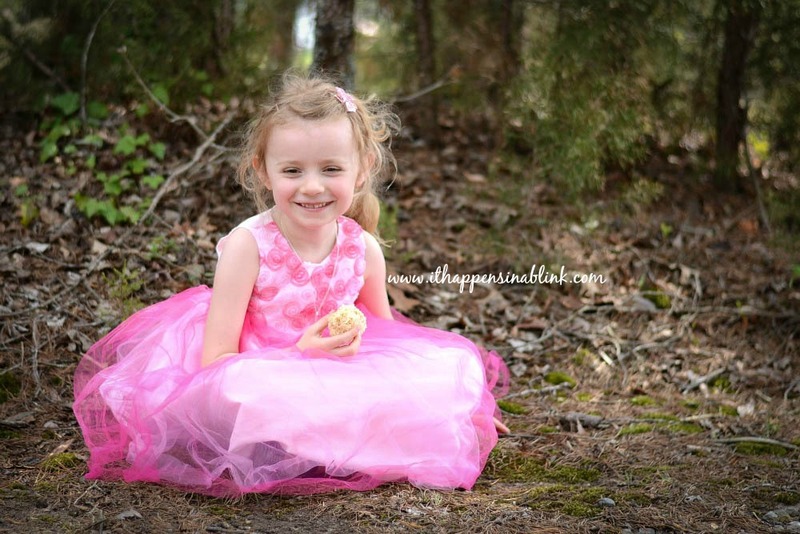 She believes throwing sprinkles– even if they don’t stick to the food– makes everything better. Shortly after making our treats, my daughter mysteriously disappeared. I discovered her in the yard sneaking in a treat before dinner. I asked her to rate the treats that we made on a scale from 1 to 10 (with 10 being the best) on how the treats look and taste, as well as how fun it was to make them. In typical girlie fashion, she rated everything a 10 and “the best ever”. How fun do you think this simple cooking activity is? 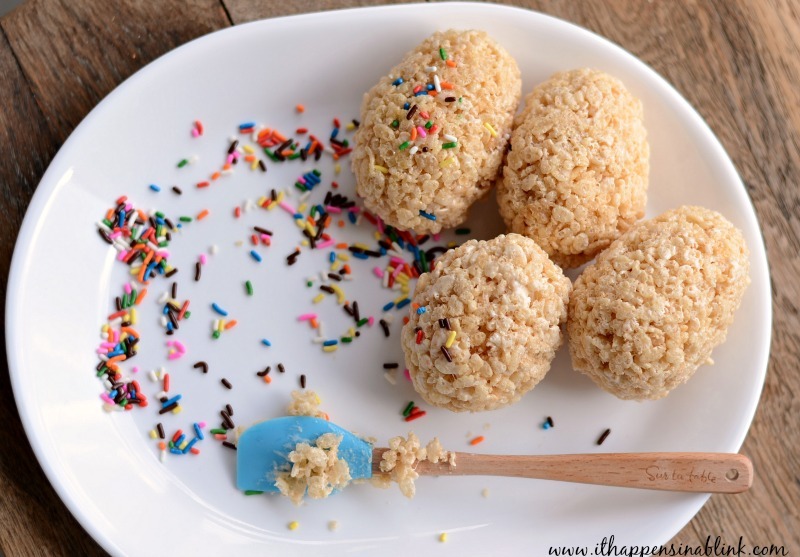 Find more easy recipes on the Rice Krispies webpage, the Rice Krispies Pinterest Page, and Facebook page. 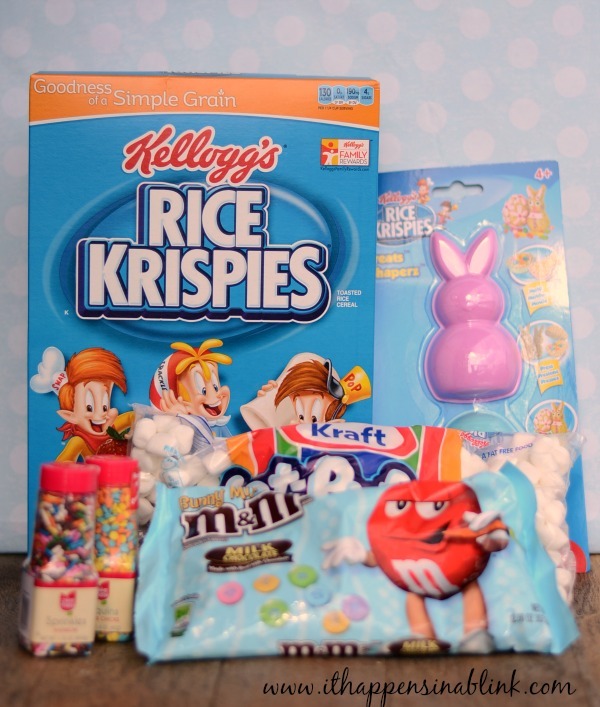 There is also a fun Rice Krispies Pinterest Contest, so be sure to enter that, as well! Use the hashtag #easytomake when sharing your photos on Twitter and Instagram so that we can all see what fun you and your kids are having in the kitchen. Wow, what a fun idea for Easter…..and so easy too! Rice Krispy treats are the best! Thanks for the idea! Those look like a TON of fun to make! Ohhhhh this is genius! I might have to make some of these for Easter! How cute! Pinning this for later. This is such a cute idea! I love the hidden surprise of the m&ms inside. 🙂 My daughter would love them so I’m for sure going to make these in the next few days! What a clever idea! We’re having a little Easter get together this Saturday…maybe we’ll have to make these! I agree I think Pinterest will be the death of all of is! 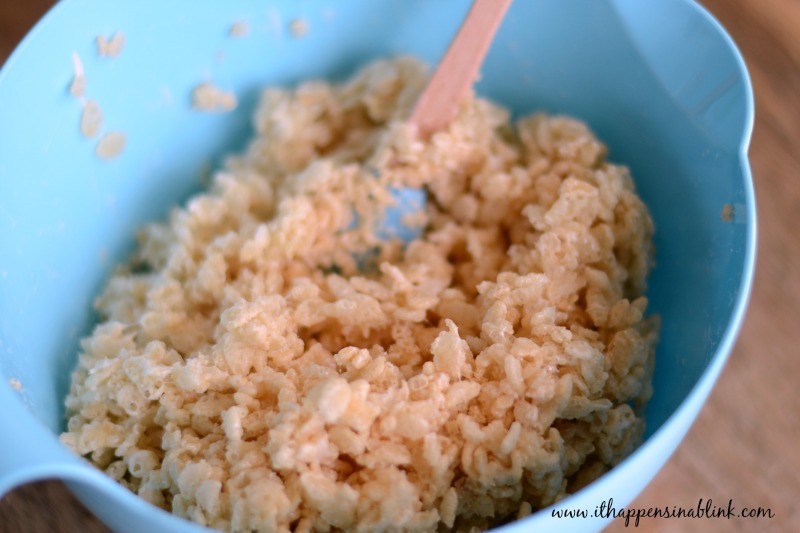 I love making Rice Krispies treats!!! These are super cute! I love this! I wonder I can do it with a simple large plastic easter egg. I would hide jelly beans! This is such a fun idea! I really love that you put candy inside – so cool! What a fun idea, Melanie! My kids would love the surprise inside. Pinning! I love the surprise eggs! My daughter would freak! I think I’ll have to make these!! Such a fun treat! The surprise center is a great idea! So cute! I just bought the cereal this morning and I was thinking about making these. Thank you for the recipe! They are very easy! Good luck! Oh these look so fun and I think I have all of the stuff to make them today – yea! Visiting from The Party Bunch. How fun, I love how there is m&m’s inside. I co-host Sweet and Savoury Sunday and would for you to stop by and share these and other recipes with us. Happy Easter, have a great weekend! Thanks for the invite! I will try to check it out! 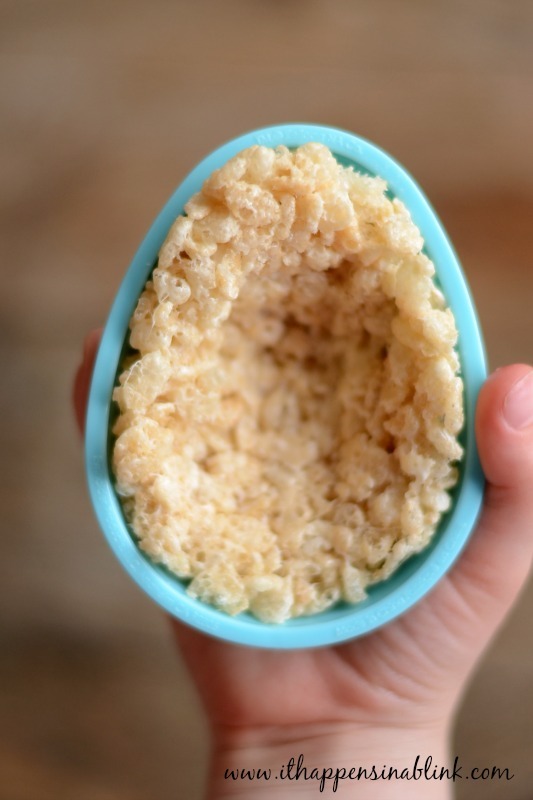 I really like your idea of shaping the rice krispie treats into an egg shape. 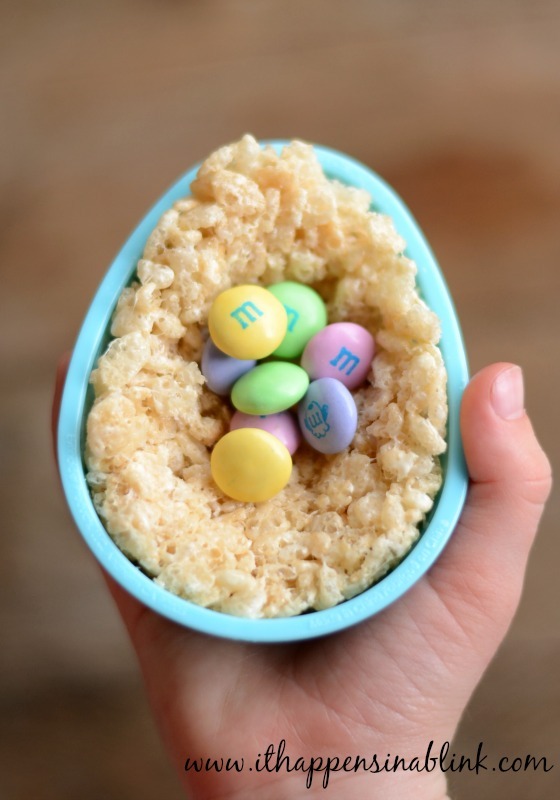 I am going to make these, but rather than putting candy in the middle, I plan to leave it empty to represent the empty tomb when Jesus rose from the dead and lives again. Thank you for the inspiration. That is a great idea. Thanks for sharing! In charge of snack this week at church… How many eggs did you get with 1 recipe? It’s been a while since I did these. I think at least 12. They are fairly large, and since there are 2 halves with the M&Ms in the center, they take a lot of rice krispie stuff. If you make the eggs smaller, then you may be able to get more.